This is one of the few times I was outside on a sunny day, with my camera and a willing person to take my photographs. Having work from Mondays to Saturdays and parents for bosses will do that to you. If you must know, this was not planned, hence, the messy ponytail and still-wish-I-was-sleeping look (also known as the I-forgot-to-apply-concealer-look). 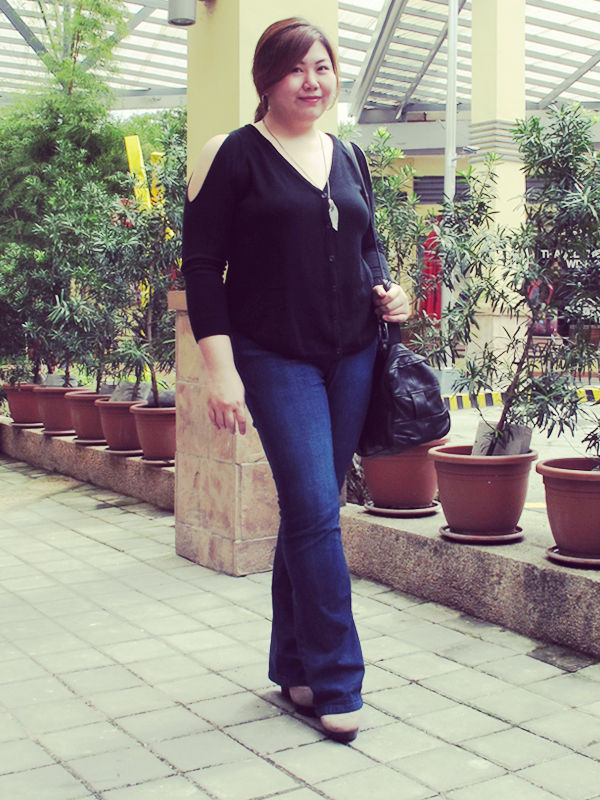 But it was a Sunday and I was out to have lunch with my family at Greenhills Town Center after we went to church. Looking at these photos, I am still a decidedly enthusiastic cut-out fan. See how the cut-outs in the shoulders area show off a bit of skin but still look proper enough for attending church? And how it allows a bit of ventilation for when the Manila heat feels too much? And how people always seem to think I've managed to lose a few pounds whenever I wear similar tops? You can't have guessed all that by just looking at these photos, but I am telling you. Shoulder cut-outs are some of this plus-sized girl's best friends. If you want, I'll introduce you to some of them. Here's teal blue, neon yellow, tribal print and neon pink. Cold shoulders, hot style! You have such a pretty face and smile along with cute hair. The jeans and shoes are great compliments. Amazing stle, Abi. Ah, I've blogged about it before! I like those shoulder cut outs! That top is the cutest...love this look! I have always been leary of them but seeing how good you look is making me want to try them!! So pretty! I like the natural look on you, btw. Thanks! I love cut-outs...makes ze arms look smaller. Haha! Thank you for your nice comment. I love this cardigan. Great oufit. Makes me want to get a pair of denims from M&S. The cut is nice.